We first heard about MusicWorX from a fellow music-loving friend and instrument collector. Interested in all things instrument-related he had noticed there were some good finds and this music store situated in Jan Smuts Avenue. Intrigued Cherry Pill went along one Saturday morning to browse at the store. There was a coffee machine , a stage , loads of great instruments to try and other musicians just hanging-out or jamming…. we stayed much longer thn we intended and left with a new instrument in hand! Since that first encounter we have frequented Music Worx countless times . We particularly loved the Thursday night jam sessions, where again good coffee and music-vibes were on offer. 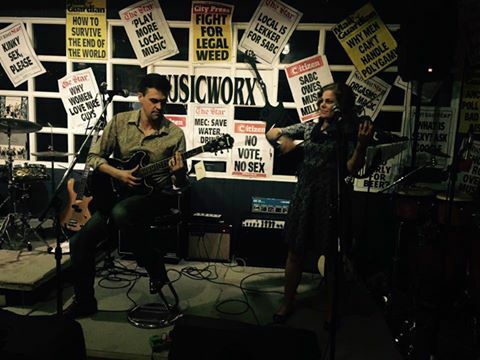 Roger the owner at MusicWorx has a particular knack for creating a casual but quality platform that attracted musicians of all calibres from beginners to pro-musos to these Thursday evening jams. Cherry Pill had the pleasure of jamming with fantastic players, mostly from other genres which has definitely enriched our own performances. End of February 2017 saw the last of these jam nights at the old location as MusicWorx has just moved to new premises. Whilst we await to see if the jam nights may be reinvented in the new space, we wanted to write a post saluting Roger on the chapter that was Jam Nights at MusicWorx. This video was recorded by fellow superb fellow musicians Tebz and Karabo who also performed on their special brand of original music on the night. Tebz managed to capture the ambience of the venue so well in this video, we just had to release it. Rory is playing on a coveted guitar that is up for sale! Cherry Pill are performing ‘Swing Gitane’ off our Si Tu Savais Album’.